Heavenly blog! : No. 799: Top of Nazi list, the story of Moritz Rabinowitz who was probably the first Norwegian-Jew who killed Nazis from Norway! No. 799: Top of Nazi list, the story of Moritz Rabinowitz who was probably the first Norwegian-Jew who killed Nazis from Norway! Top of Nazi list, the story of Moritz Rabinowitz who was probably the first Norwegian-Jew who killed Nazis from Norway! I attended the unveiling of Moritz Rabinowitz in Haugesund. This was right before I moved to Oslo, I remember. Rabinowitz is honored with a memorial extreme south of Harald Gata, on Lillesund in Haugesund. The memorial was unveiled on 6 May 1986 by the then President of the Storting Jo Benkow in what is now called Rabinowitzparken. Moritz was beaten to death by the Germans, for a cruel barbarism! Well-written and engaging children's book about a dark chapter in Norwegian history. bold marketing ideas he teamed up as one of the city's wealthiest men. As the situation in Europe was worse for the Jews, beseeching him in personal telegrams statesmen as Roosevelt and Chamberlain to do something before it was too late. When the Germans invaded Norway, Rabinowitz was one of the first they were looking for. He managed only to remain hidden, but eventually he was found and captured in December 1940. He was deported to Germany and died in a concentration camp in February 1942. The story of Nazi hunting Moritz is dramatic, and is described in a way being in the mind long. Picture of the book (actually two books, one for youth and one for adults). Moritz Moses Rabinowitz (born 20 September 1887 in Rajgrod in Podlaskie Voivodeship in Poland, died on 27 February 1942 in Sachsenhausen) was a Norwegian Jew and businessman resident in Haugesund. Moritz Rabinowitz was the son of Isaac Levi and Chaya Rosa Rabinowitz. He had two sisters and a younger brother. Brother emigrated also to Norway and settled in Bergen. Moritz Rabinowitz came to Bergen in 1909 and Haugesund in 1911. He was married to Johanna Goldberg (1889-1939), the daughter of the cantor Eduard Goldberg in Berlin. Her brother Salomon Goldberg is known for the construction of the synagogue, "Fried Piston» Halensee there. Moritz and Johanna Rabinowitz had a daughter, Edith, married Reichwald, born in 1918. In Haugesund he opened a small clothing store. His idea was to give farmers, fishermen and laborers stylish fashion for a reasonable price. This he managed. The little shop was an empire of their own clothes factories and shops all along the coast of Haugesund in the north to Kristiansand in the south. 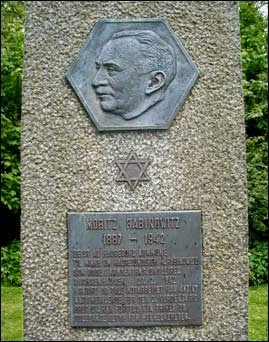 Rabinowitz was the only Jew in Haugesund in the interwar period. When Rabinowiz came to Haugesund, he decided quickly to become. There was something about the eagerness and informal to haugesund holders who accused him. His first store was opened in Kaigaten. A few years later he opened the shop in what was once the city's main street, Strand Street. Rabinowitz imported shoes and men's clothing from Germany, and opened gradually stores in Haugesund, Stavanger, Sauda, Egersund and Kristiansand. In 1938 he reached a high point in his success with the construction of the ultra modern factory "Condor" in the center of Haugesund. At the most, he had around 150 people at work. Rabinowitz promotional actively make and was in that respect, pioneering in this area. He succeeded in building a strong brand associated with quality suits and shoes. Rabinowitz was an outsider, one who thought big and different - a visionary. Already in 1933 he published a book named The World Crisis and we where he attacked Hitler and Nazism. He continued the fight by writing hundreds of letters to the editor in Haugesund Avis. He sent telegrams to the Hindenburg (1932), Roosevelt (1935) and Chamberlain (1938). When the Germans came to Haugesund, they knew of his anti-Nazi activities and Rabinowitz was the first they'd arrest. In six months he managed to stay hidden on farms along Åkrafjorden, but on 4 December 1940, he was arrested on the island Toft calf outside Skånevikstranda in Sunnhordland. He was sent to Stavanger Prison and from there to Møller Gata 19 in Oslo in February 1941. Then to Åneby before returning to Møller Gata 19 for deportation on 22 May 1941. He was deported to catch the ship MS "Monte Rosa". In Stettin he wrote his will, with his fellow prisoners as witnesses: Police Chief Wilhelm Christian Rynning-Tonnesen as executor, police constable Kleppe and Major Bache as witnesses. He was sent to Sachsenhausen concentration camp, where he was sent on a "Jew barracks" and died there on 27 February 1942. The stated cause of death was pneumonia. His daughter Edith (16 August 1918 - 3 March 1943), her husband Hans Reichwald (29 September 1916 - 17 January 1943) and their son Harry (23 November 1940 - 3 March 1943), suffered the same fate in Auschwitz. His Reichwald was arrested on 26 October 1942 and deported to ship "Gotenland» 26 November 1942. Edith with her son Harry was taken on 26 November 1942, deported with DS "Danube" 24 February 1943 and taken to the gas chamber at Auschwitz arrival. His brother Hermann Herschel Rabinowitz, who was living in Bergen, died in Auschwitz on 22 December 1942. The film about Rabinowitz, The Man Who Loved Haugesund, became a box office success under the Norwegian Film Festival in Haugesund in 2003. Around 1,300 people saw the film in Haugesund within two days. In the film were people who met and knew Rabinowitz interview, but even 60 years after the war it was given some "unfortunate" statements about the "typical Jew" in the film. The film is released on DVD. Nordland Visual Theatre and Wakka Wakka (a Norwegian-American Theater Company) made ​​puppetry-performance Fabrik-The Legend of M.Rabinowitz opening in Stamsund on September 9, 2007. Fabrik played over 200 times in Norway, USA and England for almost 15 000 people. The play won the Citation of Excellence in Puppetry from UNIMAR-USA in 2009. Marius Leknes Snekkevåg have for Scene Kraft wrote a play about Rabinowitz. The piece was first shown at Haugesund Theatre in April 2011. It has since shown at the The Norwegian Theatre (May 2011) and Rogaland Teater (November 2011). On his deathbed in Sachsenhausen he, through a German who later hit a bunch in there, said the following: "If you ever meet someone from Haugesund, I will ask you to say hello from me and tell them that the first thing I thought of the next of my own family, workers, employees and friends I had in town. " Rabinowitz is honored with a memorial extreme south of Harald Gata, on Lillesund in Haugesund. The memorial was unveiled on 6 May 1986 by the then President of the Storting Jo Benkow in what is now called Rabinowitzparken. Rabinowitz seminar was held in Haugesund for the first time on 20 September 2012. The program reflected the four pillars that go through life Rabinowitz: World Borger, entrepreneur, minority representative and human rights activist. The seminar was organized for the second time on 20 September 2014. In connection with the bicentenary of the Constitution, was the theme of the second workshop "Access forbidden! ", With clear references to the Jewish section and its parallels in the past, the present and the future. Rabinowitz was on 9 November 2013, the 75 anniversary of Kristallnacht, the memory of a stumbling block outside his former home in Strand street in Haugesund.